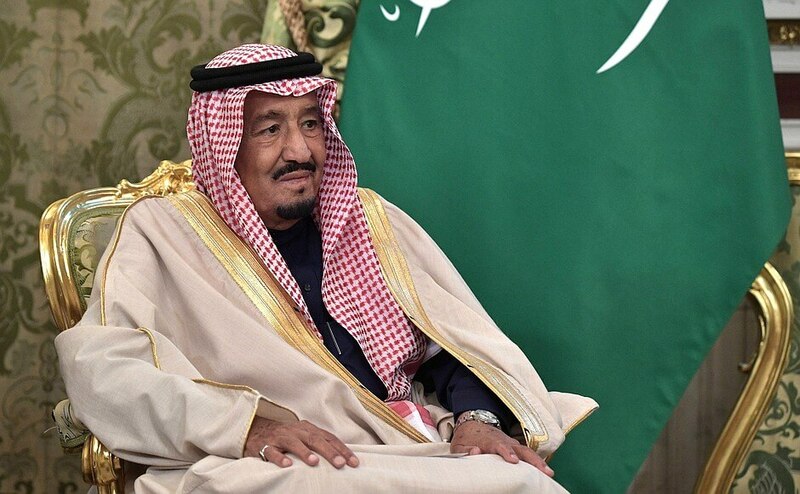 Russian President Vladimir Putin held talks with King Salman bin Abdulaziz Al Saud of Saudi Arabia, who is in Russia on a state visit. Russian - Saudi talks in expanded format. Moscow, Kremlin. 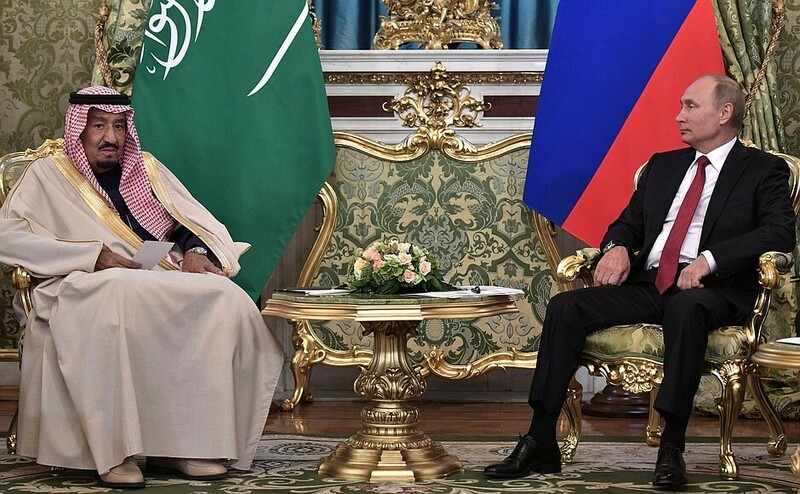 President of Russia Vladimir Putin and King Salman bin Abdulaziz Al Saud of Saudi Arabia discussed a broad range of issues of Russian-Saudi cooperation and prospects of enhancing bilateral cooperation in the trade, economic, investment, cultural and humanitarian areas. They also exchanged views on international issues. A package of documents was signed following the talks. 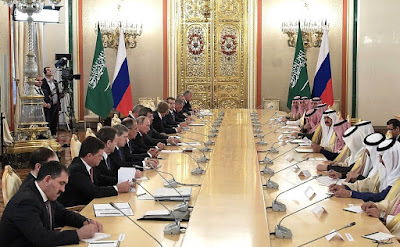 The Government of the Russian Federation and the Government of the Kingdom of Saudi Arabia signed an agreement on cooperation in the exploration and use of outer space for peaceful purposes and the road-map of trade, economic, scientific and technical cooperation between the Russian Federation and the Kingdom of Saudi Arabia in the mid-term perspective. The sides also signed interdepartmental memorandums of understanding and cooperation in the areas of communications and ICT, labor, social development and social protection, and the purchase of military goods and localization of their production. 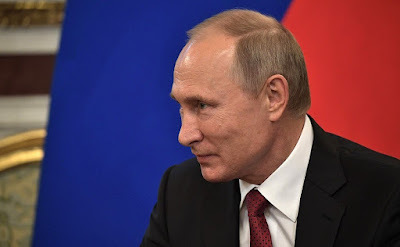 The documents signed include programs on cooperation in the fields of culture, agriculture, and the peaceful use of nuclear energy, as well as a contract on general terms of organizing licensed production of AK103 Kalashnikov rifles and different munitions. An agreement to establish a $1 billion energy investment fund with the participation of the Public Investment Fund of Saudi Arabia (PIF), the Saudi Arabian Oil Company known as Saudi Aramcoand the Russian Direct Investment Fund (RDIF), as well as the agreement on investments of up to $100 million by the PIF and RDIV in the United Transport Concession Holding were signed. King Salman bin Abdulaziz Al Saud of Saudi Arabia with President of Russia Vladimir Putin in the Kremlin. In addition, an agreement on establishing a $1 billion high-tech investment fund, which provides for investment by the PIF and the RDIF. The sides also signed an agreement on cooperation between Saudi Aramco, the RDIF and Sibur Holding on oil refining projects. Beginning of talks between King Salman bin Abdulaziz Al Saud of Saudi Arabia and President of Russia Vladimir Putin. Let me cordially welcome you to Russia’s capital, Moscow. Thank you very much for accepting our invitation and coming on a visit. This is the first visit of the King of Saudi Arabia to Russia in the history of our relations, and this itself is a landmark event. Our relations have a fairly long history. In 1926, 90 years ago, even more, our country, the Soviet Union at that time, was the first state to recognize the newly formed Kingdom created by Abdulaziz bin Al Saud. And now we are very pleased to receive you here, Your Majesty. I am confident that your visit will serve as a good impetus for the development of our intergovernmental relations. I am grateful to you, Your Excellency, Mr. Putin, for the warm welcome. 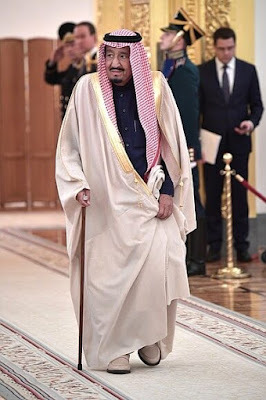 King Salman bin Abdulaziz Al Saud of Saudi Arabia. We are happy to visit your friendly country. We are striving to strengthen bilateral relations in the interests of peace and security, in the interests of developing the world economy. 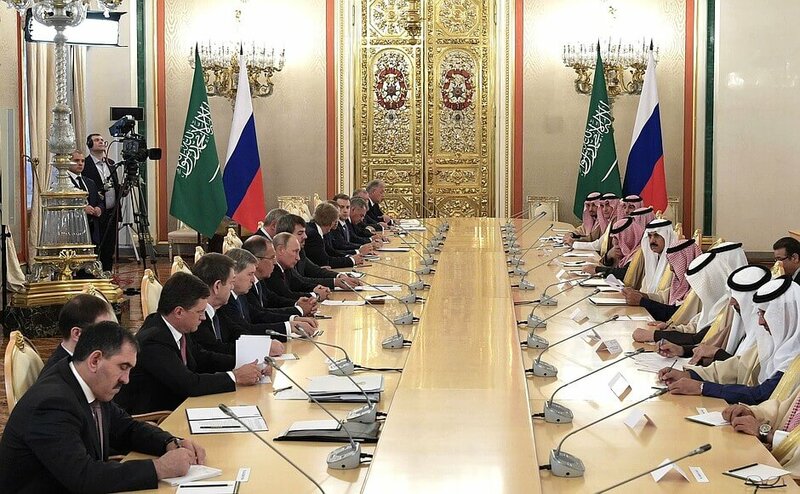 Beginning of Russian - Saudi talks in expanded format. Your Majesty, colleagues. Allow me to welcome you once again, now in an expanded format. 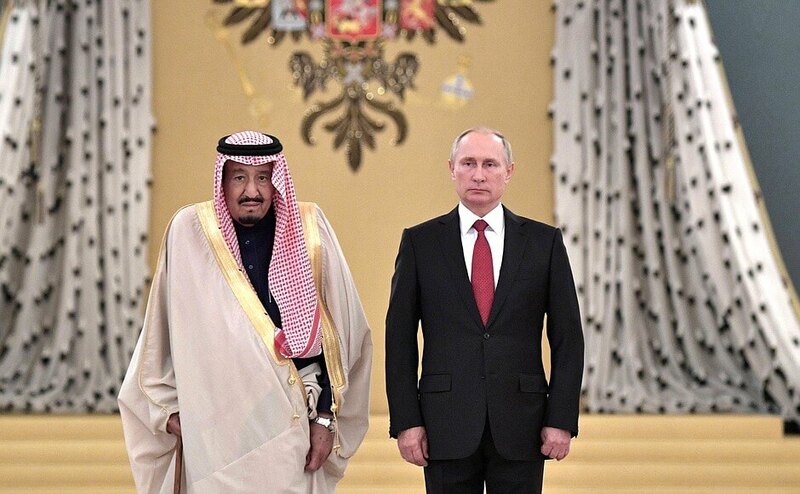 King Salman bin Abdulaziz Al Saud of Saudi Arabia and President of Russia Vladimir Putin. First of all, I would like to thank you, Mr. President, for your warm welcome and hospitality that we received in this friendly country. King Salman bin Abdulaziz Al Saud of Saudi Arabia during Russian-Saudi talks in expanded format. We strongly believe that there are great opportunities to expand and diversify the scope of our economic cooperation, to establish the trade, economic and investment foundation that would enhance the use of our specifics for the benefit of our countries and in the interests of developing trade throughout industries according to the Saudi Arabia’s Vision 2030 program. King Salman bin Abdulaziz Al Saud of Saudi Arabia in the Kremlin. The international community today is called upon to energize its efforts against extremism, terrorism and the sources of their financing. Realizing the enormous danger that terrorism and extremism pose for the security and stability of countries and peoples, Saudi Arabia called for establishing an international counter-terrorism center under the aegis of the UN and provided $110 million for this center. 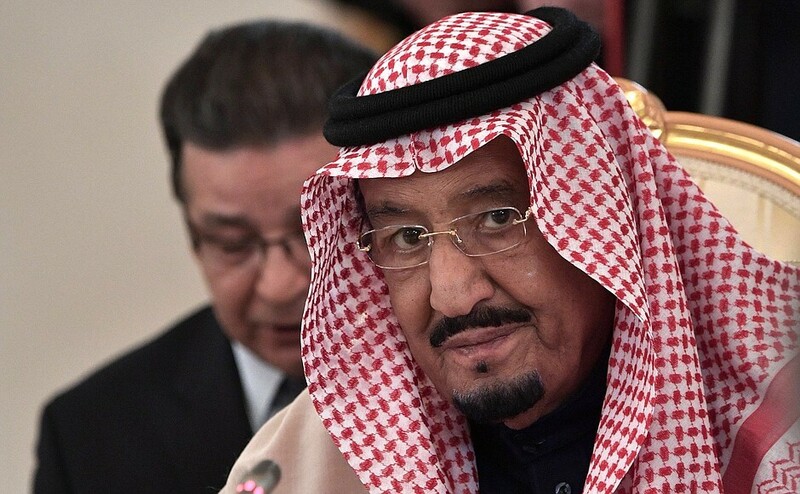 Saudi Arabia established a military Islamic coalition that now comprises 41 Muslim states, and initiated the opening of a global center in Riyadh to combat extremist ideology. We are stressing the importance of putting an end to the suffering of the Palestinians, and speaking in favor of the Arab Peace Initiative and international law serving as a basis for achieving overarching, just and permanent peace that would ensure the Palestinians’ right to create their own independent state with a capital in East Jerusalem. We are also stressing that the security and stability in the Persian Gulf and the Middle East is the most eagerly sought-after and essential prerequisite for achieving security and stability in the world. This requires that Iran abandon attempts to interfere in the domestic affairs of the states in the region and stop the activity that destabilizes the region. As concerns the Syrian crisis, we are committed to pushing for its resolution in line with the Geneva I decisions and UN Security Council Resolution 2254, to finding a political solution that would guarantee security, stability and Syria’s unity and territorial integrity. We call for the international community to take responsibility for the issues of Rohingya Muslims and find a solution that would protect them from violence and put an end to their suffering. We are also stressing the importance of preserving Iraq’s unity and territorial integrity and unification of the domestic front against terrorism. Finally, I am pleased to extend my invitation to the President to visit the Kingdom of Saudi Arabia to continue and complete our consultations, and to improve the cooperation between our countries in all areas. Thank you once again to you, Mr. Putin, and the Russian Government for the warm welcome and hospitality. We wish your country and the friendly Russian people further progress and prosperity. Your Majesty, thank you very much. Thank you for the invitation. I remember my previous trip to your country, and by all means I accept your invitation to visit Saudi Arabia once again. 0 Comment to "Vladimir Putin held Russian - Saudi talks in Moscow"